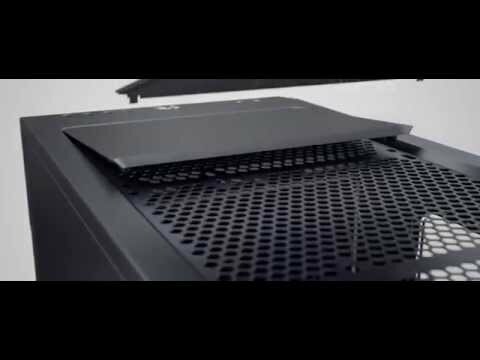 Product Overview The Fractal Design Define R5 is the next evolution in the widely popular Define Series. Packed with intelligently designed enthusiast-oriented features delivering a silent case with powerful and expansive air and liquid cooling support, presented in a stunning Scandinavian inspired construction. The Define R5 case reaches the highest level of silent computing through strategically placed dense soundabsorbing material, ModuVent™ fan vent covers and finely tuned Dynamic Series fans. The Define R5 was designed with configurability in mind, accommodating up to 8 hard drives and all modern graphics cards. Should you wish to expand your system with water cooling components or more fans the layout can easily be configured to meet your demand. Features • Optimally designed for silent computing with high density noise-reducing material throughout the case for maximum sound absorption, while not compromising on airflow and cooling capabilities. • Including two Fractal Design Dynamic GP14 140mm fans developed for superlative airflow while still maintaining low noise levels. • Newly configured front door with dual side mounting to better fit your work space. Fractal Design Define R5 White Mid Tower ATX/mATX/mini-ITX Computer Chassis with Window, USB 3.0, + Ultra Silent Design is rated 5.0 out of 5 by 3. Rated 5 out of 5 by TAZ007 from Almost Perfect Ok, so great case, many options, but not any quieter than the case it replaced, which was a the fractal design arc mini r2, that said on lowest fan speed, its quiet enough, i have the windowed version so thats maybe why its about the same. Great improvement as far as cable management goes, even if using a fully wired PSU i was able to keep it all nice and tidy, and the velcro straps are quite amazing. The only letdown is the hole and grommet size where you would feed your 4+4 cpu power connector, its simple does not fit with the grommet in place, you have no choice but to remove it and feed it through and then replace the grommet which is not that easy to do. Other than that, it is a really nice case, excellent quality and finish, good and practical features, many options for air or water cooling all for a modest sum of money. Rated 5 out of 5 by JamesMUK from Great case. Quiet and easy to use The case has plenty of space to allow for a straight forward build. The fans are good and keeps everything cool and they are quiet. Scan website was easy to use and has good descriptions and delivery was also on time and kept me updated on when it was due to arrive. Rated 5 out of 5 by calmly from Very quiet and neat looking Components went together well, with good cable harnessing. Hello, will it fit Corsair H110i GT in this case with optical drive in. Yes it absolutely will, if you read the item description you can see it has support for upto 280mm radiators without the removal of the optical drive cage and the H110i GT is a 280mm radiator so everythings good. Also take note that the Define R5 has a height limitation of 55mm and the radiator + fan (from the H110i GT) goes upto 52mm, so just be wary of that if you plan to put on aftermarket fans.